The Cleft Lip and Palate Association (CLAPA) were delighted to see BBC’s ‘Call the Midwife’ feature a baby with a cleft in Sunday’s episode. From the reactions on social media and beyond, it’s clear this has done a great deal to raise public awareness and understanding about a condition most people still know very little about. Set in the early 60s, Call the Midwife has a history of dealing with a wide spectrum of issues around pregnancy and childbirth, highlighting the unique characteristics of the time period while involving the show’s audience in heartfelt emotions that remain relevant in any decade. In the UK alone, three babies are born with a cleft every day. The treatment they’ll receive in 2019 may be very different to the 1960s, but what the mother on Call the Midwife goes through on screen will familiar to thousands of parents across the nations who recalled the moment they learned their baby had a cleft. Many parents describe this moment as one they’ll never forget, the instant everything changed and a condition they may never have heard of before suddenly became a central part of their lives. The uncertainty of what lies ahead for their newborn baby can be terrifying and, at such a vulnerable time, the ignorant reactions of others can be devastating. We applaud ‘Call the Midwife’ for handling these charged, emotional moments with compassion and empathy and for not shying away from the reality of how this can affect a family, even today. As someone born with a cleft lip and palate some years ago I’m watching #callthemidwife with great interest. I’m sure @CLAPACOMMUNITY are glued to the screen too! I know the medics who delivered me were not nearly as sensitive to my parents as the #callthemidwife crew. Since CLAPA was first contacted by the BBC to help them ensure this episode hit the mark, we have eagerly awaited its air date so we could see the reactions from our community. Unsurprisingly for a ‘Call the Midwife’ episode, many were moved to tears, stating that seeing those early moments reflected on screen brought the emotions rushing back – the shock, the concern, the coping with cruel comments and feelings of guilt. Some of you shared your own stories, mirroring the fictional mother’s experiences of being moved to a different room or being asked to cover your baby’s face to avoid ‘upsetting’ other new parents. You’ve shared your own hurtful reactions from the public, friends and family and even health professionals. Some have expressed the opposite – relief that their experiences were so much more positive than what they saw on screen and praise for the progress in medical care, support and information that made this possible. 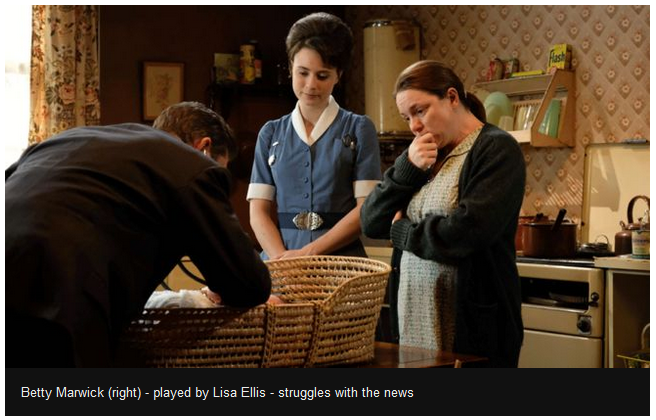 Occasionally, there was concern that the negativity and fear surrounding the baby’s birth in Call the Midwife might upset expectant parents with a diagnosis, making them worry even more about what might happen on the big day. Whatever feelings this episode may have brought to the surface, we hope our community is as pleased as we are that the subject of cleft is reaching such a wide public audience, who may now respond with understanding and empathy rather than ignorance. We cannot thank the producers of Call the Midwife enough for shining a light on a condition that affects 1,200 new families every year and for helping to create a kinder, more accepting world for people born with a cleft of every age. What were your reactions to this episode? Let us know in the comments below.